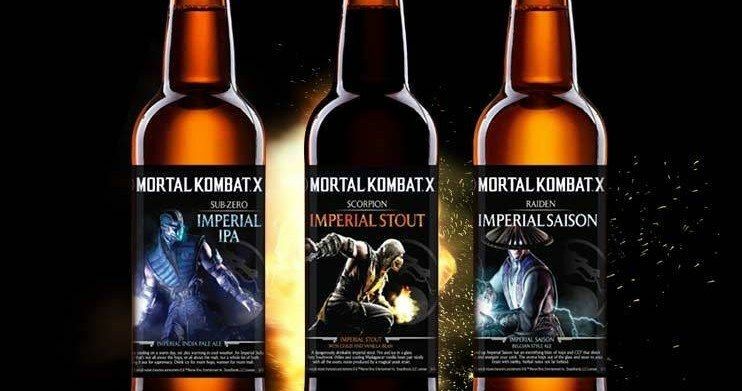 Warner Bros., Sound Brewery and Global Beverage Traders are pleased to announce a series of beers based on the massively popular video game Mortal Kombat X, which was released to consumers in 2015. This all-new beer series boasts bold flavors aimed to match the intensity and excitement of Mortal Kombat X. This new series of beers inspired by Mortal Kombat X is a limited release and available for shipping in 22oz single serve bottles (12/22 oz case). Consisting of a "Scorpion" Imperial Stout with chilies and vanilla bean; "Sub-Zero" Imperial IPA the perfect mixture of hops and malt; and "Raiden" Imperial Saison a Belgian style ale that gives you an electrifying blast of hops and CO2. The Sub-Zero Imperial IPA is refreshingly cooling on a warm day, an Imperial India Pale Ale that's not all about the hops or the malt but is a whole lot of both fighting it out for your palate's supremacy. Drink icy for more of the hops or warmer for more malt. This amped up Raiden Imperial Saison has a blast of hops and CO2 that will hit your tongue with a bang. The aroma jumps out of the glass with its earthly and herbal notes not far behind. The Scorpion beer offers unique blend for great Imperial Stout brings both fire and ice into your glass. The fiery southwest chilies and cooling Madagascar Vanilla Bean pair nicely with the exotic notes produced by our own yeast strain. This new series of beers inspired by Mortal Kombat X is a limited release and available for shipping in 22oz single serve bottles (12/22 oz case). Product produced by Sound Brewery, Poulsbo, Washington and distributed exclusively by Global Beverage Traders. The Mortal Kombat X- inspired beer series is produced under license with Warner Bros. Consumer Products. Global Beverage Traders is a San Diego based international beverage management and distribution company specializing in delivering unique premium innovative craft and specialty beverages to today's consumer palates. For more information contact [email protected] or call 858-717-8125. Take a look at these new Mortal Kombat X beer bottles below as we await the big screen Mortal Kombat reboot coming soon to the big screen from Saw creator James Wan.